There are, perhaps, few events in sports as hyped as the annual NFL Draft, and this year marks no exception. The hoopla over the top pick now begins and ends with Stanford quarterback Andrew Luck, who is all but guaranteed to go to the now Peyton Manning-less Indianapolis Colts. At pick two, the Washington Redskins traded up with a specific player in mind, that being Baylor quarterback Robert Griffin III (aka, RG3). TEAM GHOST Blackmon is a “speed guy” in the gaming world, too. 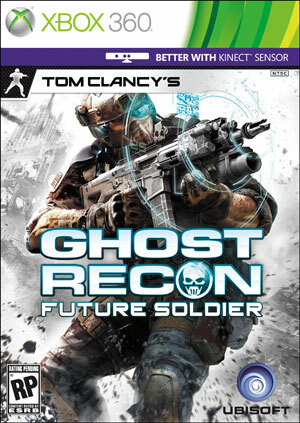 As a member of Team Ghost, he bring his speed and communication skills to Tom Clancy’s Ghost Recon: Future Soldier. Aside from taking names (i.e., defensive backs) on the football field, Blackmon also enjoys taking names on the video game screen. He is currently part of “Team Ghost,” a promotional team for Tom Clancy’s Ghost Recon: Future Soldier, which also includes NBA star Kevin Love, reality TV starlet Coco (Ice-T’s wife) and emerging rapper Kendrick Lamar. Every member of Team Ghost has a special skill. 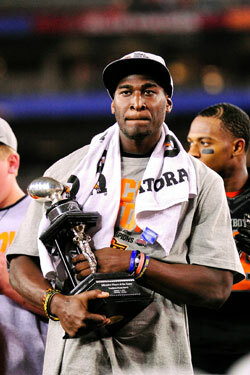 Blackmon’s? “I’m the speed guy,” he said. “Quick on my feet, constantly communicating, first guy to the checkpoint.” The description also seems fitting for Blackmon’s prospective NFL career, so expect to see him cross the checkpoint (i.e., end zone) on a fairly regular basis.